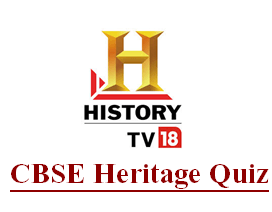 CBSE launches the 14th All India Heritage Quiz in partnership with History Channel which will be aired on January 7, 2015 (Wednesday) at 10.00 AM on History TV18. This will be a repeat telecast of the quiz which was originally telecast on January 3, 2015 (5 PM-Saturday). The 14th All India Heritage Quiz was also telecasted for the second time on January 4, 2015 (3.30 PM-Sunday). About 3471 students from all ten regions of CBSE schools participated in the initial elimination round. While 20 teams have reached the semifinal found, only four of them made it to the finals. The CBSE Heritage India Quiz was introduced by CBSE in 2001 in order to instigate the developing minds with the rich socio cultural heritage of India.